There aren't enough food, service, value or atmosphere ratings for Hiep Thanh, Vietnam yet. Be one of the first to write a review! This is a quiet place to eat about 3 blocks from the hotel with much to offer for anyone taste. Very reasonable costs, providing fans turned on when we sat down to eat. Found us a english speaking server that helped navigate the menu. Very tasty meals on both occasions visited. Waiters were swift, even running sometimes. Patronised by plenty of local residents when we were there. A large canteen style restaurant, plenty of locals. Quick service and pretty good menu for area. Beef with lemon grass nice. Menu in English, 'fried' means deep fried. 279,000 for 3 Inc drinks. 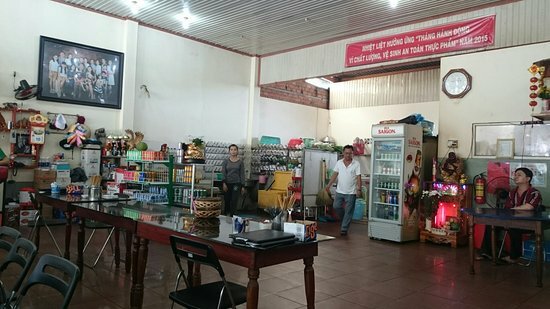 One of the biggest advantages of this restaurant, that is a typical Kontum style, is that the menu is in English. The food is quite good. The beer is cold. Whenever I visit Kon Tum city I have dinner there. The foods are really delicious. Services are very good too. Restaurant serving good meat. We had a beef steak, rare, with garlic and soya sauce and a very good roasted chicken. Cold beer. Inexpensive. All locals recommend this place. Get quick answers from Hiep Thanh staff and past visitors.